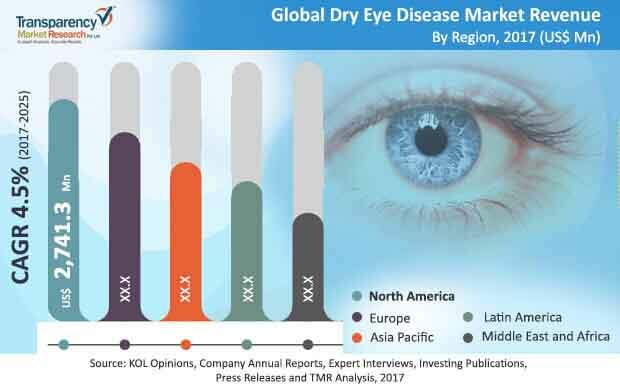 The global dry eye disease market is envisaged in a report by Transparency Market Research (TMR) to find an increase in the level of competition due to rising prevalence of the eye condition. Research and development of groundbreaking drugs could see a rise as several patents stand on the brink of expiration. As a result, enrolment in clinical trials is expected to surge in the coming years. With a view to strengthen their position in the market, companies could ink licensing agreements and forge tactical collaborations. In order to win over their rivalry with other players, they are anticipated to back their blockbuster drugs. Allergan plc, Santen Pharmaceutical Co., Ltd., and Novartis AG are some of the companies that could make their presence known in the market. TMR envisions the global dry eye disease market to post a 4.5% CAGR during the forecast tenure 2017-2025 to be worth a US$7.7 bn by the end of 2025. In 2016, the market was valued at a US$5.0 bn. By product, the market is expected to witness anti-inflammatory drugs securing their lead in terms of revenue share. Regionally, taking into account its US$2.7 bn valuation in 2017, North America could take the driver’s seat of the market. Growing incidence of dry eye disease is foreseen to give a strong momentum to the global market. While this could be an obvious growth factor of the market, there are other factors that could further push growth in the near future. For instance, increasing healthcare expenditure and patient awareness are expected to emerge as promising growth factors of the market. Growth of the market could also increase due to the introduction of advanced medications and diagnostic equipment. Over the years, treatment for dry eye disease has evolved drastically with the advent of techniques that are ahead of the times. This could be evidenced by the introduction of advanced hyaluronic acid-based lubricants and lipid emulsions replacing artificial tears that include isotonic sodium chloride. Patent expiry is prognosticated to loom as a threat over market growth of players. On the other hand, exorbitant pricing may not be a good strategy to adopt for players who possess patents for their drugs. Moreover, the dearth of prescription drugs in the international dry eye disease market could hamper demand in the future years. Nonetheless, the bandwagon of developing novel therapeutics for effective treatment of dry eye disease is prophesied to increase the popularity of the global market. Launch of new eye drops and swelling investment in drug-loaded punctal plugs and drug-eluting contact lenses could help with more opportunities in the market.